Just northeast of the University of Notre Dame campus, winding through 250 heavilywooded acres, Warren Golf Course at Notre Dame is truly a classic test of golf! Built in 1999 by golf course architects Bill Coore and Ben Crenshaw, this beautifully-designed course, with each hole connecting effortlessly to the next one, will challenge your skills as well as refresh your soul. Afterwards, enjoy the 1800’s-style clubhouse for a sandwich and ale, and the opportunity to peruse Notre Dame golf team’s past accomplishments and a completely-stocked golf shop. The pro shop is resplendent with its fine collection of Notre Dame merchandise and the knowledgeable and friendly staff is always there to assist with instructional, club fitting and buying needs. Since its opening, Warren Golf Course has been honored by many awards. A few of those include being featured in Golf Digest’s 2002 “Places to Play” and selected as the “No. 2 Course in Indiana” in Golfweek’s Special Edition of “America’s Best Courses”. 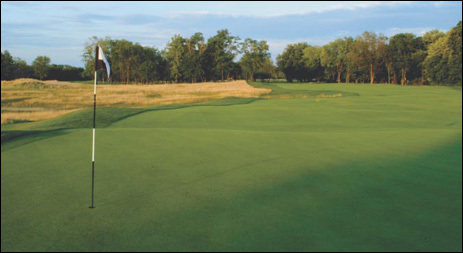 The Warren Golf Course at Notre Dame will again host the 2006 Western Amateur Championship Qualifier.